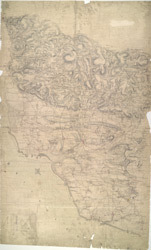 Thomas Budgen, who worked on the majority of the Welsh plans, is probably the author of this drawing of part of Glamorgan. Following military convention, Mynydd Maendy, Mynydd Llangeinwyr and other reliefs to the north of Bridgens are represented by dense hachuring (interlining)graduating to lighter bands towards the summits. Commons, broken mountainland and upland moors are represented by open dotting. In the lower part of the sheet, field boundaries indicate agricultural land.